With the state of the world these days, everyone can use a License To Chill. Jimmy Buffett, in conjunction with some of the most prominent names in country music (Clint Black, Kenny Chesney, Alan Jackson, Toby Keith, George Strait, Martina McBride) has issued the ideal license in a delightful, musical form. Buffett, whose songwriting roots can be traced back to Nashville , didn't limit himself to country artists or country songs on this endeavor. The album is an eclectic mix of new Buffett material, traditional country, as well as songs from Don Gibson, John Hiatt, Leon Russell and Jerry Garcia. With the first release from the album, the remake of Hank Williams' classic "Hey, Good Lookin'," (sung collectively by Black, Chesney, Jackson, Keith and Strait) claiming a spot in the top ten of country radio in the same week it was released, this is clearly an indication that returning to your roots, especially with talented friends in tow, is a very good thing. The album is the perfect marriage of puka and peanut shells and whether you choose to listen to it in a tiki hut on a beach, in your local honky tonk bar, or just driving in your car, it doesn't matter, this is an "enjoy it where ever you are" compilation of music. How Buffett came to record this album is also an interesting story. He had started his career in Nashville more than thirty years ago and when his country music career failed to take hold, as we all know, he and his music went elsewhere. A few years ago, a really good friend pointed out that a few up and coming country artists displayed a passion for the now infamous "Buffett lifestyle." Intrigued, he began seriously listening to country music again and then decided that the time was right to give the genre another try. Buffett says that his only intent was to "fire a shot across the bow of country radio but thanks to Alan Jackson, we seemed to have missed the bow and dropped a 500 pound gorilla on the play lists with 'Five O'clock Somewhere'." This is an accurate analogy and License To Chill is an appropriate encore. 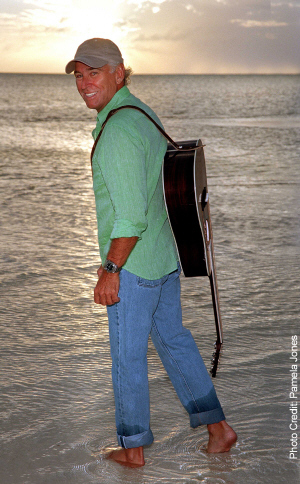 Who knows, it just might bring some long over-due recognition to a very talented Nashville songwriter who finally figured out that to get your foot in the proverbial Music City door, you only have to prop it open with a few shells and some beach sand.